Home > Current Buzz > Syracuse Arts Academy Do FAME Jr.
as Syracuse Arts Academy rehearses for their upcoming performance of Fame Jr.
Leg warmers, suspenders, big belts, sparkles, blue eye shadow and waist-high blue jeans filled the stage at Syracuse Arts Academy April 24 through 26. 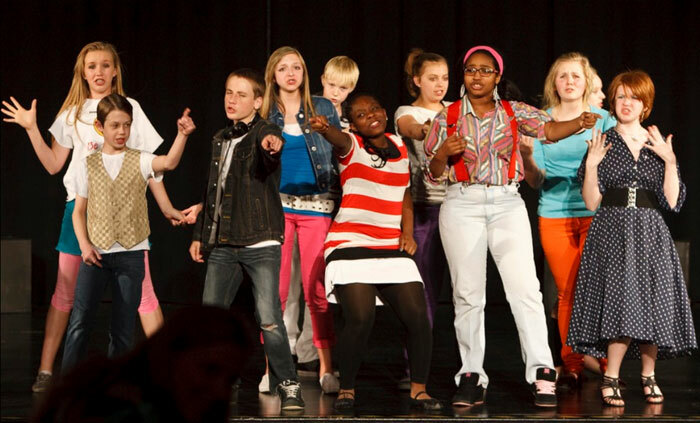 The middle school’s production of the musical Fame JR. looked like a flash back to the 80s. Drama teacher Melissa Burke chose Fame JR. for her spring theater performance. Burke said that as she was deciding which play for her drama class to perform she looked at the individual talents of her students. She thought Fame JR. was the perfect fit to showcase the singing, dancing and acting abilities of her students. Musical Theater International offers a Broadway Junior Collection with shows that are only 30 to 60 minutes in length for young performers. MTI shortens full length musicals and takes out anything offensive for the age group performing. Fame JR. is a one-act musical set during the last years of New York City’s High School for the Performing Arts, the perfect choice for students at Syracuse Arts Academy, a charter school that focuses on Arts Integration. Many of the students attending Syracuse Arts Academy have a deep interest in performing and have been active in community theater and dance training programs since elementary school. The story behind the movie Fame is meaningful to them as Syracuse Arts Academy combines art-based teaching strategies with standards-based instruction and assessment. 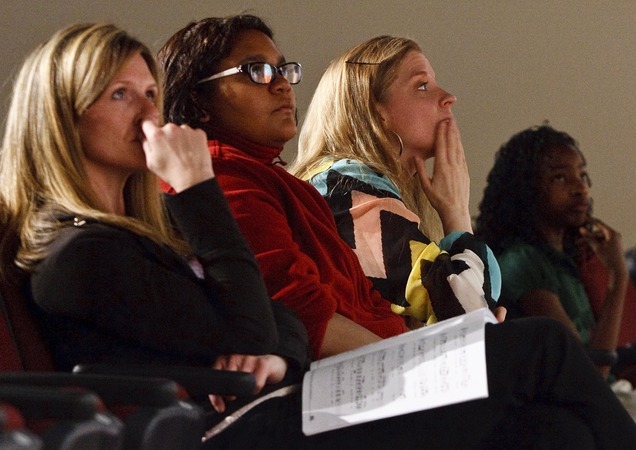 The performances were the culmination of hundreds of hours of practice that began in January. A total of 26 cast members made up the play. Behind the scenes, the school’s special tech club’s seven members ran the sound board, lighting board, spotlight and curtains. Parents helped with costumes, props and set construction. "Our goal is for the students to understand the dedication it takes to put on a great performance and learn how to do everything as well as they can," Burke said. One obstacle students had to overcome was absences. "Every single person is important to the show, and when someone is missing it makes practice difficult," Burke said. Ninth grader Miranda Spaulding, 15, played the role of Carmen Diaz. Miranda learned that in addition to learning her lines, dance moves, and music, she had to know where every prop was and costumes had to be exact. Her favorite part of the play? "Singing for sure. I don’t really dance much unless people make me," Miranda said. Eighth grader Jordan Willis, 14, is a veteran actor. The part of preparation that made Jordan the proudest was seeing his friends grow and perform. "I don’t like it when people only care about themselves," Jordan said. "I like it when they care about everyone, and I want to be one of those people."